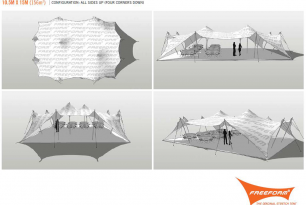 On this page, you will find various stretch tent technical data downloads that will prove useful to understanding the ratings and protocols of the stretch tent system. Listed below the Freeform Wind rating and analysis data sheet, as well as the Freeform Fire-retardancy data sheet, our wind mitigation document and Terms and Conditions Document. We up date these documents regularly but. However, we advise that you email us on [email protected] to ensure that you have the most up to date information on our products. 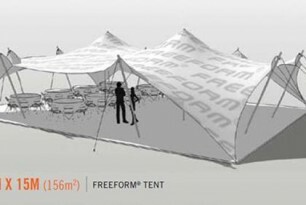 The Freeform Stretch tent System wind rating document is supplied to us by Freeform © SA limited. Furthermore, it is rated on a 10,5m x 15m stretch tent in the represented set up. 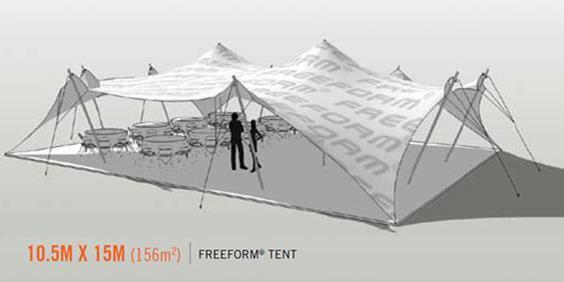 The Freeform Stretch tent system can be rigged in many different ways. The 10,5m x 15m was tested with sides up, a more unstable set up in very windy conditions. When the tents are set with more sides down the wind rating rises. The most stable set up is ‘Bedouin’ or all sides down. For further information on wind ratings or safety please contact us via the contact form or give us a call on 07570 361 282.